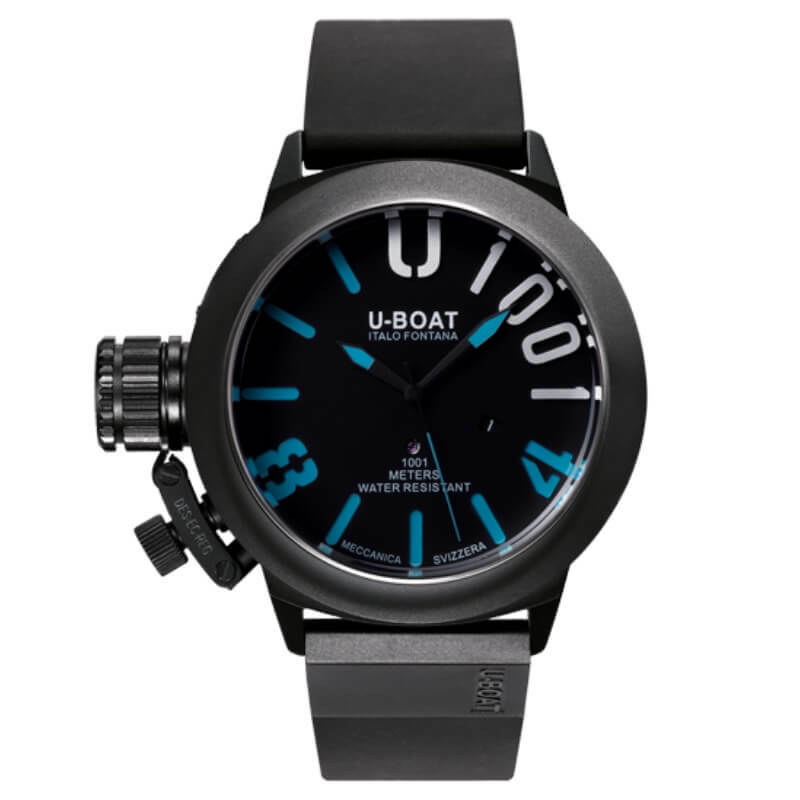 Automatic mechanical, modified and personalized to U-Boat specifications for stem position at 9 o’clock. Height: 4,60 mm. 25 jewels. Power reserve: 40 hours. Hours, minutes, seconds, date at 4 o’clock. Frequency: 28.800 vibrations per hour, 4 Hz. In steel with subsequent IPB coating. Distinguishing crown on the left side, with a special protective device and helium escape valve, serial number engraved on a steel plate, set on the left hand side of the case. Diameter: 47 mm. Screwed in, “Skeleton” personalized U-Boat rotor. Two superimposed dials, one in blue color luminova and the other one cut, treated with composed opaque black pigments. U-1001 caligraphy in high relief and raised. Luminova blue hands. High quality sapphire, scratchproof, flat. Black, rubber hypoallergenic with plate in steel and subsequent IPB coating, deployante buckle. Width: 23/22 mm. Fastened to the case with screws.